NOT YOUR AVERAGE HALF MARATHONER! HOW SIGNING UP TO DO A HALF MARATHON FOR CHARITY CHANGED MY LIFE! 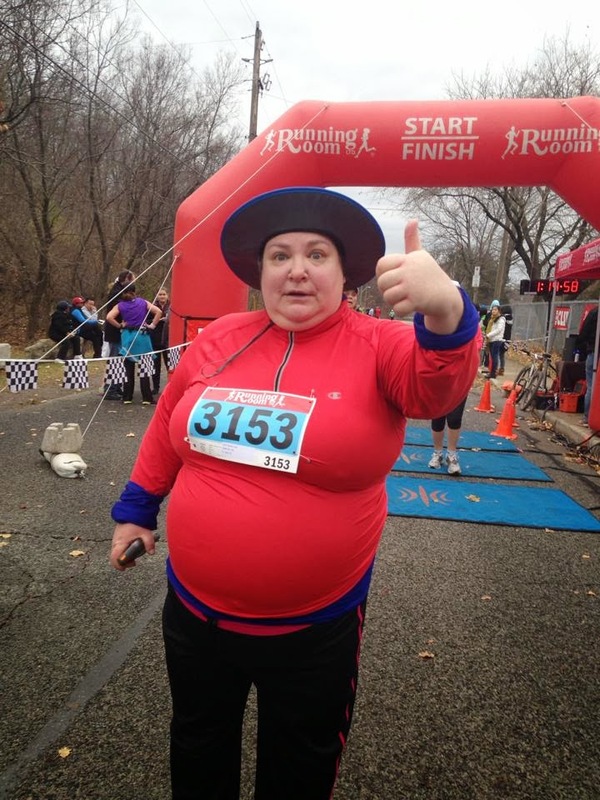 : When you should volunteer at a race instead of running it! Hanukkah Hustle 2013- Race dedicated to Sharon Flynn! When you should volunteer at a race instead of running it! 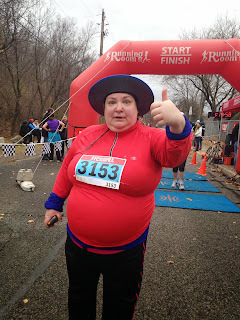 Hanukkah Hustle 2013- Race dedicated to Sharon Flynn! Sharon Flynn has been a friend of mine for almost 17 years. We don't really see each other in person but we do stay in touch on FB. A while ago, Sharon had a severe and very complex fracture of her leg. She has been recovering for months and despite her agony and how she has to learn to walk all over again, even with ongoing serious injury she has been positive and upbeat and her own adorable self the whole way. Last night, I decided to do the Hanukkah hustle (fundraiser for our local Jewish retirement home -shalomvillage.ca 's active living programme) in honour of Sharon's recovery and since I gave a donation in addition to signing up for the race, I mentally thought it would be nice if the merit for that good deed went to Sharon's recovery in the hope that it will be speedy and complete. So, despite the debacle that was my morning (in more than one way!) I decided that in the race itself, I would be cheerful, upbeat and positive in honour of Sharon since despite her massive injury she has been that way through her recovery! My only other goal was to beat my Wellwood time of 1:01 and change. Oh yeah and not to fall since I fell both at Wellwood and the Hamilton half marathon. Here are the debacle things! 1) I could not sleep last night. I guess I was charged from an event I did and then it just took me a long time to settle down. It was 4 am when I finally fell asleep. 2) I did not lay out race clothing and equipment or charge a wireless headphone. Marc found me some ear buds. This figures prominently in why this race was a totally failed attempt at a better time in a 5k! 4) No coffee cause I didn't want to have to use porta potties. 5) When I got into my car, it would not start but it was blocking the other car so we had to push it out into the street. This contributed further into us being quite late. 9) Eventually I got there, and he gave me my bib but we put the wrong ones on each other. Then Lori pointed out that we had no chips on our shoes (which I had never seen before because both the other races I did had chips in the bib- waaay easier!) We went to go get chips, put them on, and then had to exchange them when we realized our mistake. We changed both bib and shoe chips (thanks Jeff Laskey for helping me with mine!) and all the sudden, I realized the race had started. 10) Technology was a serious issue this morning. It was so stupid. First my phone was not sufficiently charged. Then I had to wrestle with earphones. wires just don't work for me when walking and ear buds never work at all. I can't tell you how many times I had to start and stop, even once the race started- first I put my walking playlist on, but for whatever reason it did not shuffle. Then the ear buds kept falling out. Then I realized my battery was going to die. 11) so then I needed a place for the ear buds and put them around my neck but they fell off at some point and some nice gent picked them up and asked each runner if they lost buds. Thanks man! 12) the plastic on the cover of the iphone holder thingy needs to be cut out. It is nearly impossible to use with the plastic cover, necessitating stops to fix whatever the issue is. 13) There were so many people I knew and who were participating! First I saw the guys from Beth Tikvah house, and then I saw Aunt Goldie who is my late Grandmother's youngest living sister. Both the Beth Tikvah guys and Aunt Goldie had done the 5k walk.. I HAD to stop and hug and say hello and take pictures. I WANTED TO! 14) I suspect I have gained some weight, because my body felt really heavy. This is the first time that I actually remotely felt motivated to start following a food plan that will allow reasonable weight loss as I continue to participate in this sport that I love so much. THAT is a freaking revelation because as a compulsive eater I have felt like the whole thing was a lost cause for a long time and my goal was just to get fit instead of losing weight. 1) Screw the playlist. Just use runkeeper. Except that in fact I did not end up walking to beat my time since I had so many interruptions. I KNEW I wasn't going to beat it but decided having a good time was a more important thing to do! 2) Walk with a big smile on my face at all times! 3) Say hello or 'great job' or something to every runner running in the opposite direction or coming up behind me. 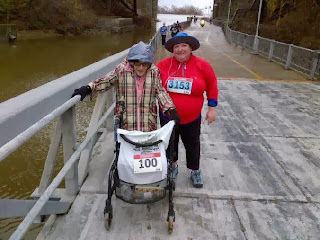 It was surprising how few people at this race commented back versus the Hamilton Marathon. Hopefully even those who didn't reply appreciated it! If not, it made ME super happy! 4) In the parts where there were no people, I did walk hard. Today my fastest pace was actually 9:38 which is considerably faster than the usual 11:40 I usually walk and which is my current marathon pace. I plan on starting to sprint in my training. 5) I was pondering my weight loss thoughts throughout and decided that I WANT a food plan. A reasonable one that won't leave me starving but which will make my body feel good and hopefully help me to release weight that is dragging me down in my sport. I don't want to do anything crazy because that is a HUGE trigger for me to go nuts eating again, but I will sort out a generous but smart food plan in the next week. That was something that became really clear during this walk and which for the first time in a very long time, I feel the desire to do in a smart way. My goal is still not weight loss overall but how to make the sport easier and faster for me! I know, I am so selfish! 6) And.... I DIDN'T FALL THIS TIME! YAAAAAY! In the end, I had a great race! I came in 8 minutes LONGER than the Wellwood race, but I had such a great time! And I did hit a personal best pace time within that longer race! What I decided is that next year, I am totally going to volunteer at this race because it will give me the opportunity to cheer people on and have a great time. I can walk to my station if need be and still get the walk in but I KNOW I will be a great volunteer! Also, I want to be in charge of volunteer RUACH (Spirit) if they will let me to make the runners/walkers feel entertained, amused and appreciated! After two races with volunteers with noisemakers and pom poms and stuff, I sort of missed the spirit today. One volunteer was clapping and shouting nice stuff but the others were mostly quiet and serious. It makes much more sense for me to contribute to this race as a volunteer than as a racer because I am incapable of not stopping and talking. I can do other timed races where I don't know people! AAAnyways, that was my morning and the hanukkah hustle. LARGE KUDOS to my husband Marc who had a personal best time! Once again, I am SO happy that we do this together! Sharon, I did you proud baby! I did this race like you are doing your recovery! Don't take it personally when you think people are not responding positively to your postivity. They are mired in their own stuff and its enough that YOU are positive for YOU! And you never know, its possible that at some point one of them will start feeling positive and start doing it themselves, or at least appreciating that you do! One of the things I am going to bring along to races if I can get my hands on them are some cheerleader pom poms! They arent' heavy! I can walk with them! I wore the rain hat because I thought it was going to rain and I didn't want rain down the back of my neck but instead there was no rain and I just looked dorky! Check it out my Hamilton Marathon injuries have healed.